Maurizio Sarri believes Real Madrid target Eden Hazard is irreplaceable at Chelsea but says the club must 'respect his decision' if he wants to leave. Hazard’s wonder goal set Chelsea en route to their 2-0 Premier League win over West Ham at Stamford Bridge, with the Belgium star also bagging a late second. West Ham’s fans taunted Chelsea by singing “He’s off to Madrid”, with the Blues’ board apparently holding out for £100million from Real to complete a transfer this summer. Hazard’s contract expires next year and, while the 28-year-old claims he is undecided on his long-term future, Chelsea boss Sarri believes the Blues continue to fight to retain their prize asset. Asked if Chelsea can afford to lose Hazard, Sarri replied: “From the technical point of view, no, not at the moment. "It’s impossible to find another Hazard; at the moment there isn’t another Hazard. The level is so high." “So in the world you can’t find another player like that. 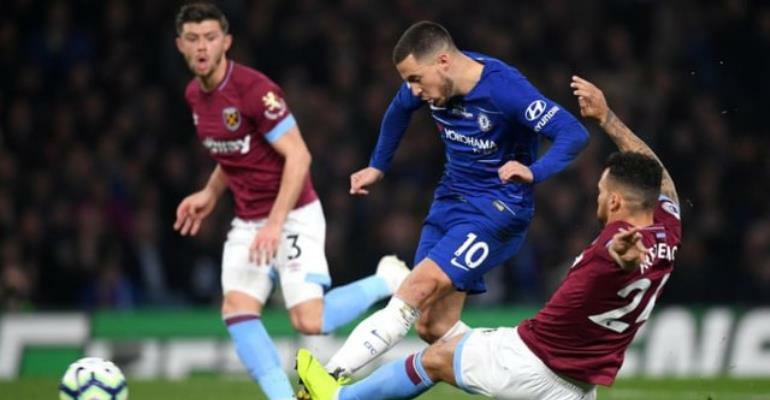 Hazard tiptoed round five West Ham players before drilling Chelsea into the lead in west London, with a goal of the rarest quality. The former Lille playmaker then buried a second at the death as Chelsea stepped up to third in the Premier League table, though having played a game more than Champions League qualification rivals Tottenham and Arsenal. Madrid appear to be closing in on a deal to sign Hazard this summer, though Chelsea are thought to be holding out for a £100million fee. Chelsea head coach Sarri remains convinced the Blues are doing all they can to hold on to Hazard, however, though did concede that the player himself will have the final say on his destination. “I am sure the club doesn’t want to sell him,” said Sarri." But of course, we all have to respect his decision I think." “He’s in the last season of the contract if he wants to have another experience we have to respect it. After branding his stunning opener “special”, Hazard insisted he still has not made a decision over whether to join Real Madrid. “They are wrong! I am focused on Chelsea until the end of the season,” Hazard told Sky Sports, when asked about the Hammers’ fans claiming he would head to Real this summer. Samir Nasri picked up a calf injury warming up at half-time for West Ham. “Nasri felt a muscle injury in his calf so he was not confident to play,” said Hammers boss Manuel Pellegrini.